This entry was posted in privacy on December 15, 2017 by alfredo. Keerthi Thomas, Arosha K. Bandara, Blaine A. Price1 and Bashar Nuseibeh propose a process (Requirement distillation) and a framework (PriF) as a way to capture the privacy related requirements for a mobile application development. The requirements distillation process consists of three main phases: “Structuring of the Qualitative Data”, “Information Flow Modelling” and “Privacy Problem Analysis”. Structuring Qualitative Data: Use Privacy Facets (PriF) framework to structure the qualitative data. The outcome is a set of predefined codes adapted to the identification of privacy-sensitive contexts. The result of completing this phase is a set of Privacy or Threats Concerns from the users. Information Flow Modeling: In the second phase, the problem models of information-flows are developed. That is done based on the information-flow problem patterns, which are provided in the PriF framework. These problem models capture the way the information is created and disseminated to other users. 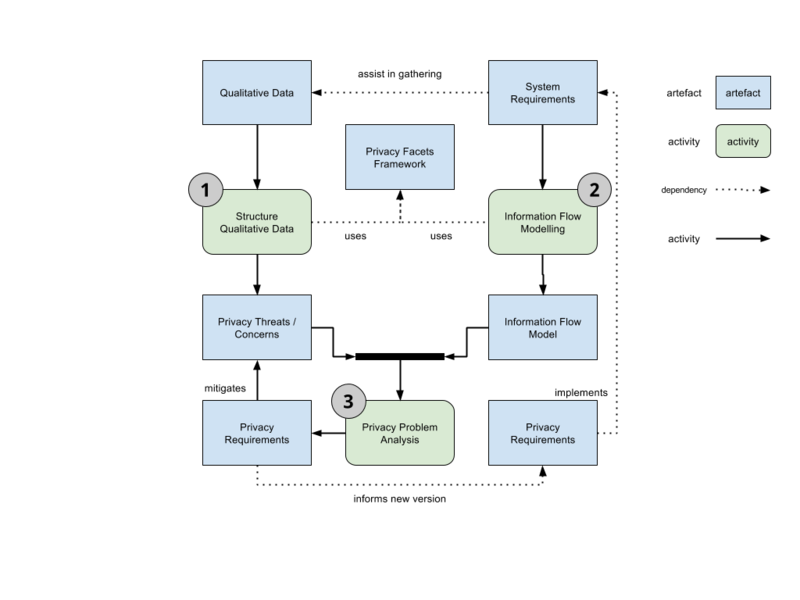 The privacy problem analysis: To elaborate a list of the privacy requirements, the privacy-sensitive context and its privacy threats or concerns are analysed with the information-flow models. information-flow problem patterns and privacy arguments language to model privacy requirements. Negative Behaviour Patterns (NBP): Situations in which the user chooses not to use an application because of privacy concerns. Negative Emotional Indicators (NEI): These are keywords that indicate that the user might have some concerns about the privacy when using the application. K. Thomas, A. K. Bandara, B. A. Price, and B. Nuseibeh, “Distilling privacy requirements for mobile applications,” in Proceedings of the 36th International Conference on Software Engineering, 2014, pp. 871–882. This entry was posted in privacy on December 12, 2017 by alfredo. This entry was posted in privacy on December 5, 2017 by alfredo.